When you book your stay at Bienville House Hotel, you can experience the best New Orleans shopping right outside your door. Big brand names, local boutiques, and gorgeous galleries are your new neighbors. It’s what makes our location in the heart of the French Quarter so special, with every option you could ask for. Come explore the incredible finds in the city’s most iconic neighborhood. Here are a few places to find the best New Orleans shopping in the French Quarter. Just steps from our boutique hotel, you’ll find The Shops at Canal Place. This upscale indoor mall is home to many well-known businesses. Enjoy one-stop shopping with high-end designers like Saks Fifth Avenue, Michael Kors, Tiffany & Co., and White House Black Market. Peruse the latest trends at Anthropologie, Brooks Brothers, Banana Republic, J.Crew, and Lululemon. You can even explore handcrafted gifts at LA Guild, a cooperative gallery of artists that belong to the Louisiana Crafts Guild. Just a short walk in the opposite direction from our hotel, you’ll find the cutting-edge at Urban Outfitters and H&M. These trendy retailers are both located in the 400 block of N Peters Street and carry a variety of affordable clothing, gifts, and home goods. 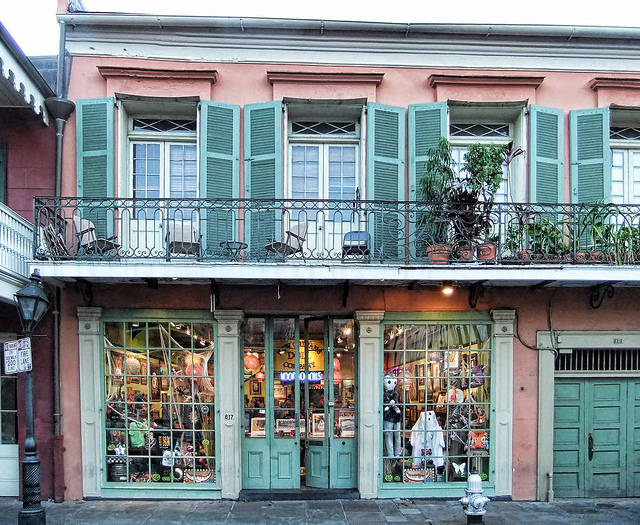 If you want to shop local, you don’t even need to leave the French Quarter. Our location has a character all its own, and so do its local businesses. For a New Orleans shopping experience that’s one-of-a-kind, you’ve come to the right neighborhood! Decatur Street is home to some of the most unique and eclectic shops in the French Quarter. Here you will find clothing boutiques, jewelry shops, and souvenirs galore. Walk a little bit further to Royal Street and you will hit block after block of antique shops and art galleries, including the 100+-year-old M.S. Rau Antiques. Looking for quirky fashion finds? The French Quarter is full of them. Shoe Be Do and Fluevog offer an eclectic assortment of footwear. United Apparel Liquidators (UAL) features great deals on high-end fashion, while QUEORK sells unique jewelry, accessories, and home decor – all made from cork! Nadine Blake features delightfully curated home goods, and Fifi Mahony’s offers a fun selection of colorful wigs and makeup. Perlis Clothing in Jax Brewery offers Cajun-inspired men’s clothing, including their signature crawfish polo shirts, and you can top off the look with a hat from Goorin Bros.
Love vintage-inspired looks? Head to Trashy Diva or Dollz & Dames for retro womenswear. Amid the French Quarter art galleries, you’ll find incredibly talented local New Orleans artists selling their paintings and crafts in areas like Jackson Square. These hand-made pieces range in price, so you’re guaranteed to find one that fits your style and your budget. Walk just a few more blocks to browse through all of the wonderful vendors set up in the New Orleans French Market! 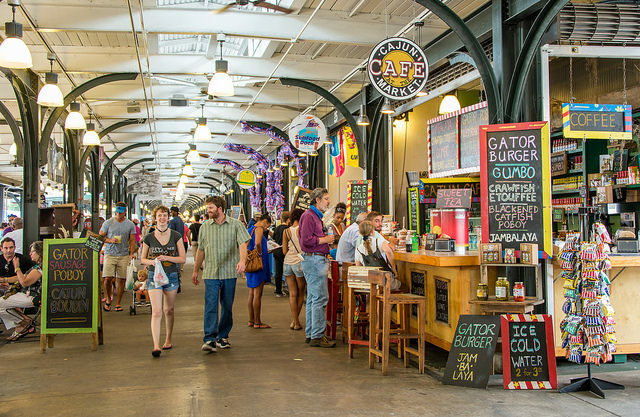 For late night shopping in the heart of New Orleans nightlife, you can walk to the Faubourg Marigny and stroll through the Frenchmen Art Market. You’ll find local artists selling their wares under a canopy of twinkling lights. If you’re still craving some incredible New Orleans shopping, these options are just the appetizer. Just beyond the French Quarter there’s plenty more to explore. New Orleans is a haven for locally-owned shopping – whether you stroll down Magazine Street, peruse the South Market District downtown, or wander Mid-City or the Riverbend neighborhoods, you will find plenty of unique New Orleans gift shops and boutiques. There’s something for everyone when you’re shopping in New Orleans. Enjoy it all with ease at Bienville House – Book your shopping getaway today!